Adobe Flash Player is known to cause a slew of issues, slowdowns, battery drain, crashes, and other problems for Mac OS X. If you’re fed up with Flash, you can ditch it by choosing to uninstall the Flash player and entire related Flash plugin package from the Mac. There are a few ways to accomplish this, but we’ll cover the simplest approach that uses the Adobe Flash Player uninstaller application to remove the plugin from the Mac, this is preferred because it’s a fairly automated process. These folders are both within the users Home directory ~ and can be access directly or from the Go To Folder command with Command+Shift+G and pasting them directly. Adobe also recommends rebooting the Mac afterwards to clear caches and complete the removal, though that may not always be necessary depending on the version of OS X. 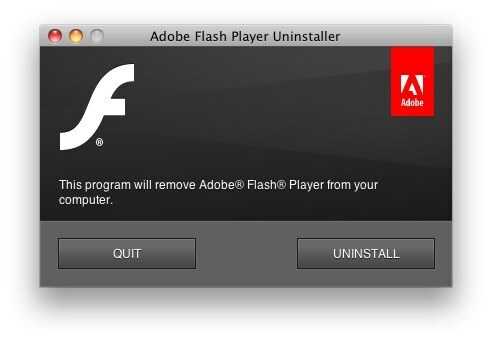 Now Flash is completely uninstalled from your Mac. You may want to go one step further and delete your Flash cookies yourself, since the app doesn’t always grab them on the way out. This insures that you don’t have any residual files laying around. Keep in mind that uninstalling the Flash plugin from the Mac does not effect sandboxed Flash Player plugins like what is implemented in the Google Chrome web browser. However, this removal process does uninstall Flash from Safari, Firefox, old versions of Chrome, and throughout Mac OS X in general. The way that Chrome handles Flash through a sandboxed plugin within the app is fairly safe, plus it automatically updates, so it makes it perhaps an ideal way to keep Flash around on a Mac if you do need to occasionally use the plugin or player for various websites. Users of Chrome can also choose to selectively allow Flash to run only when allowed by using the excellent Click-To-Play feature that is built into modern versions of the Google web browser. Personally, I keep Flash Player installed within Chrome, but if you use Safari you can use a Flash blocker so that it will only activate Flash when needed, preventing it from running on it’s own. I do this in Chrome browser with the Click-To-Play feature as well to further control how and when Flash activates. Yes, it can still cause problems from time to time, but it’s not nearly as bad as when Flash is allowed to run rampant on a Mac. Nonetheless, removing the plugin from Mac OS X is a completely viable solution for many Mac users, and fortunately is an easy task to complete, but also to reverse should you decide at a later date that you do need the Flash player on the computer. Click to Flash works pretty but seems to be discontinued ..unfortunately ..
With the YouTube 5 and HTML5 Audio plugins installed in Safari, I can get by, and for anything else I use Google Chrome. The advantage is that webserver logs show that no flash is installed when I visit a site, and higher traffic like that will help encourage use of HTML5 alternatives to flash. Since ClickToFlash reports itself as a flash-compatible player, that will not have the same effect. For clarity, I don’t have a problem with people using ClickToFlash over my method, I just want people to be informed. Uinstalling it completely is a bit of overkill. That’s like uninstalling a GPU rendered game because it kills battery life. Flash, like anything that takes a lot of resources if need be, will hurt battery life WHEN YOU RUN IT. It does not inherently do anything to your computer. Think running HTML5 videos through your GPU via hardware acceleration doesn’t hurt your battery life? Think again. – What kind of article is this? – How to uninstall Flash Player? Why? ..probably because of the battery life when you using machine like a laptop? – Maybe yes.. but even under those circumstances why you should remove something from your computer which the web needs in order to preview a massive percent of webpages which has the flash player as main requirement, including ads, banners and also so many other things..? – I couldn’t never remove the flash player from my computer because the internet doesn’ t work without it. – Browsers such as Google Chrome or Firefox has enable an auto updatable function (except that they have already installed it when you install both of the browsers in your system) which give you the ability to have always the latest version of this plugin. This is an article describing how to uninstall Flash Player from Mac OS X, if you read the article it will explain why you may want to do so. Aside from battery life, old versions of Flash can also a become a security risk. – Yes I am informed about, as I already knew that Mozilla announce before couple of days that stopped for a moment to support flash player because of a bug / security issue. Besides the older versions of flash player not observed any issue especially with the latest version 18.0.0++. Let’s say that a thorny problem here is that the users have to keep their systems always updatable. – Thanks for your feedback.